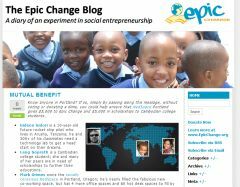 June 9, 2009 – EpicChange won the 10,000 for the technology lab in Tanzania. Thanks to everyone who voted!!! Epic Change is one of the May 2009 finalists who could win $10,000 toward implementing their idea!! It would be awesome if you would head over to Ideablob and vote for them. A free registration is required but you won’t be spammed. Taking a couple minutes of your time will really help out Epic Change. And what does Epic Change plan to do with the money if they win? They are working on expanding a primary school in Tanzania and ultimately want to add a technology center for the kids. Wouldn’t it be great for the kids to have access to technology that we take for granted?